The Nigeria Police Force says it has concluded arrangement to establish additional 100 Area Commands across the country to bring policing closer to the people. Emmanuel Inyang, the Deputy Inspector General of Police in charge of South South, disclosed this during interactive session with stakeholders in Uyo on Wednesday. 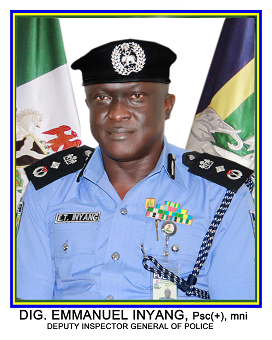 Inyang, who was on familiarisation tour of Akwa Ibom Police commands, said the establishment of more area commands and divisions would ensure police presence in every nook and cranny of the country. He explained that the purpose of the tour was to coordinate and maintain the tempo of security in the state “to enable the people to sleep with their eyes closed. “Arrangements are in top gear to ensure the establishment of 100 Area Commands and Divisions across the country. The DIG, who noted that about 155,000 police men were required in the country, added that the manpower was inadequate to cover the entire country effectively. He urged stakeholders to collaborate with the police and other security agencies to ensure crime-free society. Inyang lamented the report of increase in cult related activities in the state, adding that the people should avail themselves of the anti cultism section of the command to flush out the menace. The deputy inspector general of police assured the people that the boundary crisis between Akwa Ibom and Cross River was being tackled by government to bring lasting peace to the area. He said police would continue to be proactive in policing the country to and called on the commissioner of police to have regular meetings with herdsmen and farmers in the state to tackle the menace. Earlier, the Commissioner of Police (CP) in Akwa Ibom, Mr Donald Awunah, had attributed the success of the command to the support it enjoyed from the people. Awunah said the command would continue to solicit for more cooperation from the people and other security agencies. He commended the people and the Akwa Ibom Government for the support given to it. The Chairman of Akwa Ibom Traditional Rulers Council, HRM Effiong Archianga, urged government to provide jobs to youths to reduce crime in the state.